Your body cannot make them on its own—for this reason they must be obtained from food; it is extremely critical for pregnant women feeding their un-born baby. Both Omega-3 and Omega-6 fatty acids stimulate the formation of prostaglandin. Prostaglandins are produced by every cell in the body, and control such things as reproduction and fertility, inflammation, immunity and communication between cells. These fats that heal, play an important role in their anti-inflammatory functions and other benefits for vascular and degenerative disease. The new process of stabilizing and fortifying our omega healthy oils also helps to preserve the nutritional benefits of these very important natural extracts. Improving the oxidative stability of these products is a big breakthrough for the nutraceutical industry. Nutraceuticals (often referred to as phytochemicals or functional foods) are natural, bioactive chemical compounds that have health promoting, disease preventing or medicinal properties. Once this country’s food processors figured out how to use solvents to extract oil from soybeans and seeds, American consumers have been swimming (or drowning) in omega-6 polyunsaturates. They make up more than three-quarters of the oils and fats we eat. French fries, bottled salad dressings and all types of processed foods are full of omega-6’s. Our main proteins are full of omega-6’s as well, now that livestock, chickens and even farmed fish are raised on corn and soy instead of the naturally omega-3-rich grasses or algae. Omega-3s and -6s are the body’s yin and yang so to speak, to quote the Chinese Medicine. The two vie for space in our cells, brains, nerve endings, and they produce different hormone messengers. They compete for the same enzymes, so consuming a food containing -6s can keep the Omega-3s from doing their job. Omega-6s stimulate inflammation; Omega-3s put out the flames. Omega-6s raise blood pressure; Omega-3s lower it. Omega-6s makes your blood clot; Omega- 3s keep it from clotting. Omega-6s oxidize the cholesterol in your arteries and clog them; the Omega- 3s are anti-oxidants. The more Omega-6s we eat, the more they dominate our cells. Consuming more Omega-3s has been associated with preventing heart disease and fatal heart attacks; improving brain and vision development (so much so that infant formulas have been changed to add Omega-3); lowering blood pressure and fighting inflammation, arthritis and asthma, maybe even cancer; helping the body use insulin and fend off obesity; relieving depression and maybe reducing violent behavior. However we should point out that 59 countries added Omega-3 to infant formula before the United States came around, despite studies showing that formula with only omega-6 impaired brain and vision development. Rejuvenis Krill Oil (NKO®) is known for its unique fatty acid profile, which includes EPA and DHA, plus phospholipids. 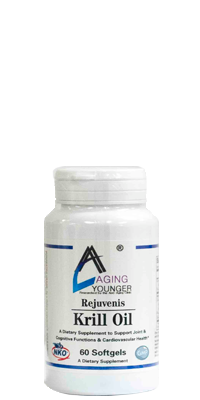 In addition, it naturally has Astaxanthin, a powerful free radical scavenger and immune supporting carotenoid. Clinical studies have shown that Rejuvenis Krill can help to support joint comfort, healthy blood lipid levels already within normal range, and may help to maintain healthy feminine balance. The Phospholipid-bound forms of EPA and DHA from Krill Oil have also demonstrated exceptionally high bioavailability.Our Rejuvenis Krill Oil is manufactured under strict quality control standards. It is tested to be free of potentially harmful levels of contaminants (i.e. mercury, heavy metals, PCB’s, dioxins, and other contaminants). Our products are designed to improve your health and you need to do is call 954-742-4430..